This is how to do it. With a killer track as the starter on the album, Soul Seller had my mind directly and the Zubleta brother must be happy with a piece of art like this. Soul Seller is an Italian band and they have a strong front man at the mic in Michael Carrata who handles classic AOR vocal tunes and more heavy tracks like in the track "Rock Stills Stands" easily. 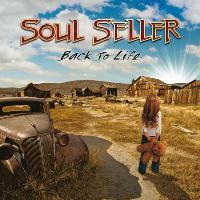 Soul Seller has worked for many years to find their own brand in the melodic rock and I must say that they have it, with a mix of strong melodic rock elements and quite hard rock tunes. The rhythm section makes a solid backup for the lead guitars and lead vocals that makes the sound wall really thick and hard. It's a 80s rock mixed with some of a modern rock, but the fire in the songs comes from the 80s poodle rock. In the track "New Power Day", the guitarist Cris Audisoio delivers a solo which got stuck in my mind. Oliver Hartmann pops up as duet vocalist on "Keep on Moving" and it's one of the best tracks on 'Back To Life'. The album is produced, engineered, mixed & mastered by Alessandro Del Vecchio and thumbs up for his work; I've got nothing to complain about. Overall this is a new and pleasant acquaintance for me. Not something earth quaking or revolutionary, just an album that I can strongly recommend to all melodic rock lovers. Don't miss out on this one. Best tracks: "Wings of Freedom", "New Power Day", "Keep on Moving", "All I Can Promise You" and "Beautiful Heretic's Dream".